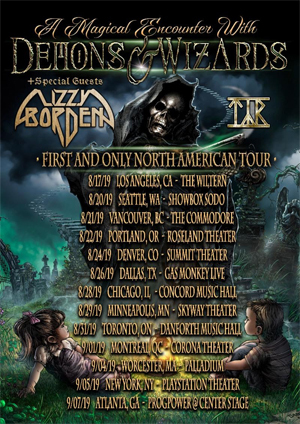 "DEMONS & WIZARDS touring North America? That is going to be pure magic, guaranteed," states Hansi Kürsch about the tour announcement. "You better not miss it, cause you never know when the Demon and the Wizard will join forces again. I am really thrilled about these first shows for DEMONS & WIZARDS in North America and we are going to make every single night a legendary night to remember. Join us on this path of glory." "I am very happy that we've announced the first ever DEMONS & WIZARDS tour in North America," adds Jon Shaffer. "We've been getting fan requests for many years to bring this show to all points around the world. To be able to do it in the USA is an exciting development. Stay heavy and see you on the road soon!" Founded in 1999 by Hansi Kürsch (BLIND GUARDIAN) and Jon Schaffer (ICED EARTH), DEMONS & WIZARDS released two highly acclaimed albums, Demons & Wizards (1999) and Touched By The Crimson King (2005). The band recently announced their worldwide signing to Century Media Records and is gearing up to release their highly anticipated third studio album (title TBD), which is scheduled to be released early 2020. Before then, Century Media Records will release the band's first two sold out albums as expanded deluxe editions. Remastered by Zeuss (ICED EARTH, QUEENSRYCHE, SANCTUARY), both releases will be out on June 7th, 2019 and will feature liner notes by Hansi Kürsch and Jon Schaffer as well as bonus material and will be released as a Limited Edition Digipak, Deluxe 2LP with Etching and LP-booklet as well as digital deluxe editions. Demons & Wizards is available for pre-order and on all streaming devices HERE and Touched By The Crimson King is available for pre-order and on all streaming devices HERE.